St Hugh’s is very pleased to announce that both the Julia Wood and Mary Renault 2019 essay competitions are now open for submissions. The deadline for both essay competitions is 5pm on Friday 26th July 2019. Established in 1971, in memory of a St Hugh’s College alumna, the Julia Wood Prize is an annual History essay competition open to Sixth Form pupils who have not been in the sixth form of any school or college for a period of more than two years. The Prize, worth up to £500, is offered by the Principal and Fellows of St Hugh’s College for the best historical essay submitted by the closing date. 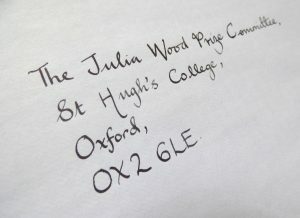 You can submit an entry and find more information about the Julia Wood prize here. The Mary Renault Prize is a Classical Reception essay prize for school or college sixth form pupils, awarded by the Principal and Fellows of St Hugh’s College, and generously funded by the royalties from Mary Renault’s novels. Submissions for the Mary Renault Prize can be from any discipline but must be on a topic relating to the reception of classical antiquity – including Greek and Roman literature, history, political thought, philosophy, and material remains – in any period to the present; essays on reception within classical antiquity (for instance, receptions of literary or artistic works or of mythical or historical figures) are permitted. Two or more prizes of £300 may be awarded, and at least one prize is reserved for a pupil who is not studying either Latin or Greek to A-level standard. More information about the Mary Renault Prize can be found here.